I could download a Live-on-CD distribution of Linux (like Knoppix) and burn it on a CD. But I’m scared to use Linux and it's too complicated to use! I could boot from USB. It's too complicated to make a bootable USB flash drive. It has not been standardized yet. Plus, my BIOS might not support it! I could boot the computer with my network adapter's PXE (Preboot Execution Environment) function. What the heck is that!? My curiosity finally got the best off me when I researched PXE this past week. Network adapter booting is an old technology. Integration with the BIOS became common in the late 1990s when Intel released its new specification for BIOS features. One of the mandatory features was PXE. In PXE, the computer can boot an operating system without any non-volatile memory like magnetic or optical media. After the CMOS POST test, the network adapter broadcasts a DHCP request. This request isn’t like any normal IP lease request. This special request appends some extra data at the end of the broadcast for PXE functionality. If a PXE-capable DCHP server does not respond, then the system halts or moves to the next boot order. However, if a PXE-capable DHCP server is listening on the network, it leases an IP address in its pool and it TFTPs the bootstrap (operating system) code. The code is placed in the host memory and is executed. Unfortunately, PXE works best with Linux, which I’m not very familiar with. I looked for a Windows alternative and I found TFTPD32. It's pretty decent. Usage of the program can be a little tricky though since there's not a lot of documentation. Basically, I followed the instructions on this article and this site. Below is my rough procedure. Create a folder called "PXE." Extract tftpd32.exe to the PXE folder. Download pxelinux.0, menu.c32, and memdisk. Or, just extract files from a syslinux distribution. Place these three files in the PXE folder. Move your floppy drive images to the PXE folder. For more information on these files, take a look at my virtual floppy drive article. Create a subdirectory in PXE called "pxelinux.cfg"
Create a file called "default" in the "pxelinux.cfg" folder. Edit the default file with a similar boot menu configuration file like the one below. Run tftpd32.exe. If windows prompts you, allow the program to access the network. 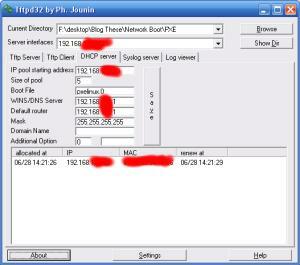 Click the DHCP Server tab and enter "pxelinux.0" in the "Boot File" field. Fill out the other fields as per your local network. Turn your target computer on while connected to the network. In the BIOS, make sure that Network Adapter is first on the boot priority order. TFTPD32 worked very well for me when I tried it. I was able to remotely boot almost any floppy image available. The only one that wasn't successful was the Linux floppy disk; I don't know why. One suggestion to the maker of this software, it would be ultra-cool if there was some sort of way that I could boot an ISO image off the network with PXE. But, I don't if the PXE specification would support that. All in all, I think it was pretty neat. I'll definitely turn to this first for my subsequent "floppy disk" boots. Since it is all electronic based (no magnetic or optical media), the speed surpasses any other boot method. Try it out! As usual, please feel free to leave any comments, questions, or suggestions below. This entry was posted on Thursday, June 28th, 2007 at 10:07 pm	and is filed under Cool Stuff, Rants and Raves, Utilities. You can follow any responses to this entry through the RSS 2.0 feed. You can leave a response, or trackback from your own site. I just want to install an OS over PXE BOOT.. i thired a lot of things.. but none of those linux tutorials or winpe things didn’t work.. So long! great article!! YOU SAVE MY LAP! Can i Install windowsxp with tftp32? i want to install it on a notebook i have without a dvd and doesnt support usb boot. i dont have winxp serveer too. GREAT tutorial! using your tutorial with some minor adjustments, i was able to recover a trueimage backup to a new hd on my diskless tablet pc!! i follow you mentioned above and i can’t able to get memdisk and virtual floppy drive. how can i boot dos through pxe to winxp machine give some tips to complete as soon as possible thank you a lot. Hi. Very useful information, thank you very much. Do you know how I can instead of this linux thing or instead of a floppy disk image boot up some version of Windows? XP for instance. How do I obtain\create a Windows XP boot image? your link is Error 404 - Not Found. Download pxelinux.0, menu.c32, and memdisk. Or, just extract files from a syslinux distribution. Place these three files in the PXE folder. Hi, I’ve managed to boot my laptop using the tutorial, and started up freedos as it was the only image I had, however I can’t see the HDD on my laptop? any ideas? Great tutorial by the way…. Try to boot freedos without the pxe (floppy or cd) to see if the pxe is the problem first. My guess is that your filesystem is NTFS or your HDD is sata (not the older eide/pata). try running fdisk. if you see partitions or a hdd, then your partitions a likely incompatible. if you don’t see partitions or a hdd, you have an incompatible hdd (most likely sata). Thanks for the response. You are right, my partitions are NTFS. I ran fdisk /xo and then I was able to change which of my partitions is the active one, which then lets me boot my old windows install and recover all my data, which was why I started down this PXE network boot in the first place. Hi! I have done everything you said in his tutorial, but when i boot from the target computer it showes me “No Boot filename received”! If you have any solution for my problem please contact me bye e-mail! Thank you! I know this article is old but it just saved me a ton of trouble after 2 days! I managed to apply a wrong BIOS update (there were 2 versions for the same laptop) to an Acer Aspire 1800. The update was done in Windows XP. After the reboot the screen was scrambled. Tried various approaches from the Net with no luck. Since I couldn’t see the screen probably, it was almost impossible to do anything. Even an Acer support person (via online chat) suggested I needed a physcial technician to fix the issue! DHCP seems to be assigning an IP address but TFTP - nothing! It PXE installs all MS OSs taking just a 2 MB download; but the best part is that it really works! I don’t even know the way I finished up here, but I believed this post was once great. piece of writing is really a fastidious paragraph, keep it up. Sheetrock, basements and crawl spaces are also damp dark places where mold can potentially grow. are some that simply need replacing. to suggesting that I extremely enjoyed the standard info a person supply for your visitors?